I had the greatest energy when I was preparing for my planning day… the part I loved best was Making my calendar out of an odd booklet that had been an insert in a magazine from quite a time ago. I cut and pasted a collage all over the front and back of the booklet, I calendarized the inside pages and added quotes also cut from magazines as well as using the coloured shapes that were already printed in the booklet. I prepared by finding some lovely images from other magazines that I thought I would use on the actual planning day. For I, being of increasing age… grin… am very slow at these on line events and I thought by selecting a variety of images I would have more time to accomplish tasks rather than rushing through searching for images. Planning day came and I was rushed… and getting frustrated, which I believe was a strategy… one doesn’t have time to over think! 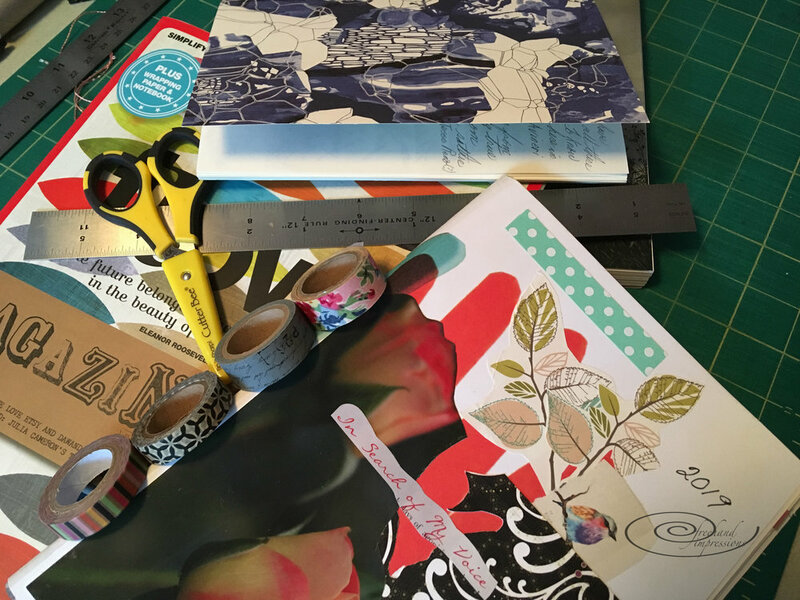 And yet when it came time to find the images that spoke to me, I snatched up a different magazine and began flipping through, and quickly tore out two images. We were to select ONE image… but I can never restrict myself to just one idea… grin… remember If I’m asked to do something I generally say no … or as in this case do more by way of indecision… grin. The questions aimed at getting us to think about… kept coming and if you read my notes made on the day I seem to be spinning in circles… Some of my favourite already finished work has involved circles. One of the images I tore out was a circle Mandella! Was I then going to be doing more circles… it seemed so… all my written words were pointing in that direction and Major frustration set in . grumbling… typical… see planning never gets me anywhere…. and more…. I felt myself beginning to fatigue. and we hadn’t got to the focus areas or the actions we wanted to add into the mix. Defining actions that will move us forward in a plan…. took me back to lesson planning,as a teacher, and I never wanted to write those down for I felt they were obvious… that if I wrote actions down I would not be open to what ever spilled actually out of the event . A true Gretchen Rubin rebel ! Persevering, holding my pen tentatively waiting for the actions words to manifest themselves I suddenly scribbled at the bottom of my page… take the painting class!… but that did not relieve my frustration . In fact it increased it, for I had been debating with myself about taking this other painting class to get myself kick started again , but writing this down as an action seemed to ignore the rest of what I had been saying during this planning day session…. Sigh… Talk about circles! I closed down. The next day upon reflection I realized that my circle had come full round. it was time to start learning what I wanted by designing my own practice. I’m going to use my book collection to stimulate painting ideas, I will paint on cloth with both fabric paints and acrylic paints until I decide which i like better. I will combine cloth and paper and make abstracts , collage and most of all concentrate my energy, my power in making things of my choosing! And I will sew and paint in circles rather than squares, at least for the time being.